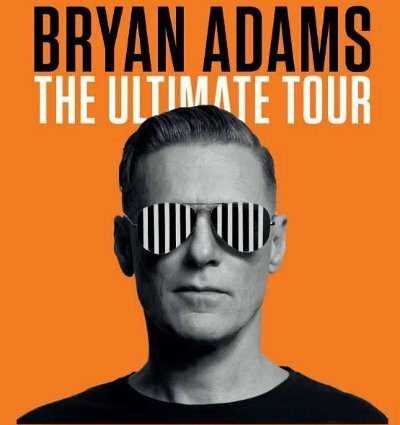 Bryan Adams must be a really nice guy. That is everyone’s impression after the Milan gig in the European leg of the ‘Ultimate Tour’, with a 2hr20min long performance that was seemingly effortless such is his natural presence, his feel for the stage and crowd. Bouncing on stage dressed in black jacket, white shirt and dark slacks as are his band members notably Keith Scott on guitar, Mickey Curry on drums, Gary Breit on keyboards and Norm Fisher on bass, he exudes energy and that goodtime vibe with his willingness to share the night with the audience. It’s a good setlist with newer tracks always followed by a classic and even if there is little dancing going on except in the rockabilly numbers, the singing in the Mediolanum forum of Milan has no boundary with the younger and older letting rip of their vocal chords, accompanying BA with every line. It’s the standard rock show songs, screens, music and lights all structured and defined with even the adlibs seemingly scripted as is the case with most bands I see nowadays, the ‘Age of Innocence’ as Edith Wharton wrote, gone, recklessness and spontaneity left to very few. Keith Scott his long term guitar player (as are all the band again adding credence to BA as Mr NiceGuy) , though technically excellent is maybe rather too over indulgent. What sets it all apart is BA himself with his ability to sing conveying emotion in his love soaked lyrics. It may be a surprise to some, it was certainly to me, that songs like “(Everything I Do) I Do It For You” can manage to grab your heart and choke the senses as that pitch perfect rasp conveys what love should somehow feel and sound like. The songs from “Reckless” and the number one singles are all sung in unison with BA happy to trade lines with the karaoke crowd. He is most definitely emotionally involved, his eyes betraying his voice which remains steadfast and true and totally in control. Special moments for me is BA on rhythm guitar and singing ‘Somebody’, the sheer brilliance of the perfect pop rock song that is ‘Run To You’, the band grooving on ‘The Only Thing That Looks Good On Me Is You’ and Bryan’s solo performances with harmonica and acoustic guitar of ‘Straight From The Heart’ and the anti war song ‘Remembrance Day’. As he leaves the stage to thunderous applause, it’s apparent that he is a true professional who has given his best and will do every night. Absolutely in the top bracket as a performer and recording artist, as a rock singer he goes straight on to the podium. BA, we all need somebody, somebody like you!